The Justice Health & Forensic Mental Health Network (JH&FMHN) is implementing six identified solutions to improve access to general practitioner (GP) services in correctional centres across NSW. To improve access to targeted and equitable GP services by decreasing average waiting time by 74% (from 39 days to 10 days) by December 2018. Population growth in adult correctional centres has been significant, and is continuing to increase. The adult custodial population has increased by 26% in the last three years and the population currently exceeds 13,000. The increase in patient population, coupled with the complex health issues of patients in custody, has resulted in an increasing demand for GP services throughout the state. This has contributed to prolonged wait times to access GP services. At the commencement of the project, approximately 17% of the custodial population were on the waiting list to access GP services. The average waiting time was 39 days, with a maximum wait time of 281 days. This redesign project was undertaken to pinpoint inefficiencies in the delivery of GP services, and develop multifaceted solutions to increase access and reduce waiting times. Six key solutions were identified and an implementation team established. Development of a clinical triage tool has been completed and approval gained to commence a trial. The initial three week trial will commence in two Correctional Centre sites with expansion to two reception centres. If the trial is successful, an electronic version of the tool will be developed and implemented along with an education package. Expansion of telehealth GP service has started with regular rostering of GP telehealth sessions. Regular monitoring of telehealth activity is conducted to continuously evaluate the mode of care. An evaluation of staff and patient satisfaction is currently underway. Introduction of a primary care assistant in nursing (AIN). A trial to evaluate the impact of an AIN to support GP clinics was conducted. The time and motion study demonstrated an increase with an AIN (50% increase). The combined evaluation of both trials will inform the development of a business case to request funding to introduce primary care AIN positions in centres with high activity. Introduction of a mental health consultation liaison nurse. An initial trial introducing a mental health consultation liaison nurse was successful. The position is now permanently funded and recruitment is complete. Centralisation of GP waitlist management, and implementation of GP follow-up processes. A trial of an administration officer to centralise GP waitlist management is underway with an end date of 30 September 2018. A new procedure for the centralisation has been implemented and will be evaluated. Development of a health centre demand profile template and draft datasets. Standard operating procedures for regular data collection have been drafted and tested. The health centre demand profile will be updated bimonthly and inform roster allocation. Development of clinical triage tool - Plans are to trial the clinical triage tool at Lithgow and Macquarie Correctional Centres, followed by Metropolitan Remand and Reception Centre and Silverwater Women’s Correctional Centre. Expansion of telehealth GP service - Statewide with a focus on regional and remote sites. 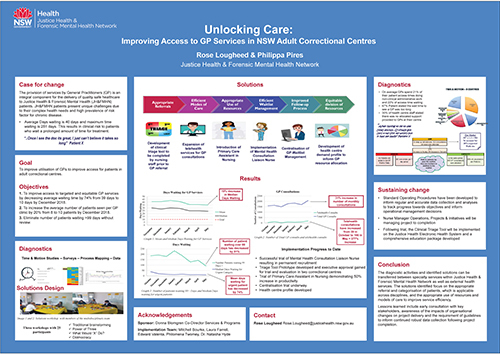 Introduction of primary care AIN - Long Bay Correctional Centre Hospital Outpatients with secondary trial at Metropolitan Remand and Reception Centre. Introduction of mental health consultation liaison nurse - Statewide service via telehealth. Centralisation of GP waitlist management, and implementation of GP follow-up processes - Silverwater Women’s and Dawn de Laos as initial trial sites. Expansion to additional sites continue through to September 2018. Development of health centre demand profile - Statewide. Activity and demand data is collected from each of the 38 Correctional Centre Health Clinics each month. The median waiting days state-wide has reduced from 31 in October to 2017 to 26 in June 2018, demonstrating a 16% reduction. Number of days waiting for urgent patients has reduced from 31 days to 12 days. A reduction of 61%. The number of patient waiting over 99 days has decreased by 35% from 186 to 120. Number of patients seen state-wide via the GP Telehealth Service trial increased from 39 in October 2017 to 127 in June 2018, demonstrating a 226% increase in clinical consults via telehealth. Ensure sufficient time is allocated to consult with relevant stakeholders. This is a time consuming exercise and needs to be accounted for in the project timeline. Have regular meetings with the project team and ensure takeaway tasks are understood by relevant members. Ensure timelines are realistic, particularly for projects with a large scope.